Canada’s top airline rewards program. How about trotting around the globe at a discount? Yes, it’s possible to fly for free – or almost free – with Aeroplan miles. But even with all that, savvy budget world-travellers know that collecting Aeroplan miles has always been a game worth playing. (They didn’t become the most popular airline rewards program in Canada for nothing). With Air Canada officially buying Aeroplan from its parent company Aimia on January 10, 2019, it's hard to say what this rewards program will look like in a year's time. Things are up in the air – but for now, you're still able to take full advantage of the great value that can be found in the Aeroplan rewards program (be sure to keep an eye on their award chart, just in case). So is Aeroplan still worth collecting? Time will tell. If you're on the fence, let our Rate Your Wallet quiz help guide you to your next go-to rewards credit card. If you're looking for the absolute best Aeroplan credit card, the is tops. And while it doesn't directly earn Aeroplan miles, it allows you to transfer your points at a 1:1 ratio. Earning 2 points per dollar spent on 4 basic categories is something no other Aeroplan card can do. Plus, when it comes time to redeem, you aren't just restricted to Aeroplan's offerings. You can redeem your points for any travel you like. Plenty of points and flexible rewards? American Express has you covered for an annual fee of $150 and no minimum income requirements. 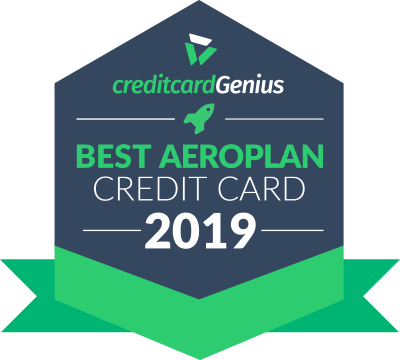 If you want a true Aeroplan branded credit card, the is your best alternative. 1 mile per $1 everywhere else. And as an Aeroplan card, all the miles you accumulate will go towards earning distinction status, giving you some great benefits within the Aeroplan program. Maple Leaf Lounge access (once per year only). Perks like these are a great way to make your travels more enjoyable. It's for an annual fee of $120 for the primary cardholder ($50 for authorized users) and minimum income requirements of either $60,000 personal or $100,000 household. Want to get an Aeroplan card that features great perks on every Air Canada flight? The the will do just that. It starts with a great sign up bonus of 50,000 miles – 25,000 just for making your first purchase, and another 25,000 after spending $1,000 in the first 3 months. 1.25 miles per $1 spent everywhere else. 4 annual one time use Maple Leaf lounge passes (only when travelling on an Aeroplan flight rewards ticket). airport benefits at Vancouver, Ottawa and Montreal-Trudeau Airports, including priority security screening and discounts on parking. It does come with a high annual fee of $399 for primary cardholders ($99 for authorized users) and a household income of $200,000. But, if you value great perks while flying, especially you travel frequently with Air Canada, this is a card to consider.